This Star has been Kicked Out of the Milky Way. It Knows What It Did. Every once in a while, the Milky Way ejects a star. The evicted star is typically ejected from the chaotic area at the center of the galaxy, where our Super Massive Black Hole (SMBH) lives. But at least one of them was ejected from the comparatively calm galactic disk, a discovery that has astronomers rethinking this whole star ejection phenomenon. An almost unimaginably enormous black hole is situated at the heart of the Milky Way. It’s called a Supermassive Black Hole (SMBH), and astronomers think that almost all massive galaxies have one at their center. But of course, nobody’s ever seen one (sort of, more on that later): It’s all based on evidence other than direct observation. The Milky Way’s SMBH is called Sagittarius A* (Sgr. A*) and it’s about 4 million times more massive than the Sun. Scientists know it’s there because we can observe the effect it has on matter that gets too close to it. Now, we have one of our best views yet of Sgr. A*, thanks to a team of scientists using a technique called interferometry. Since the 1970s, astronomers have theorized that at the center of our galaxy, about 26,000 light-years from Earth, there exists a supermassive black hole (SMBH) known as Sagittarius A*. Measuring an estimated 44 million km (27.3 million mi) in diameter and weighing in at roughly 4 million Solar masses, this black hole is believed to have had a profound influence on the formation and evolution of our galaxy. The largest object in our night sky—by far!—is invisible to us. The object is the Super-Massive Black Hole (SMBH) at the center of our Milky Way galaxy, called Sagittarius A. But soon we may have an image of Sagittarius A’s event horizon. And that image may pose a challenge to Einstein’s Theory of General Relativity. In 1915, Albert Einstein published his famous Theory of General Relativity, which provided a unified description of gravity as a geometric property of space and time. This theory gave rise to the modern theory of gravitation and revolutionized our understanding of physics. Even though a century has passed since then, scientists are still conducting experiments that confirm his theory’s predictions. Thanks to recent observations made by a team of international astronomers (known as the GRAVITY collaboration), the effects of General Relativity have been revealed using a Supermassive Black Hole (SMBH) for the very first time. These findings were the culmination of a 26-year campaign of observations of the SMBH at the center of the Milky Way (Sagittarius A*) using the European Southern Observatory‘s (ESO) instruments. The study which describes the team’s findings recently appeared in the journal Astronomy and Astrophysics, titled “Detection of the gravitational redshift in the orbit of the star S2 near the Galactic centre massive black hole“. The study was led by Roberto Arbuto of the ESO and included members from the GRAVITY collaboration – which is led by Reinhard Genzel of the Max Planck Institute for Extraterrestrial Physics (MPE) and includes astronomers from multiple European universities and research institutes. For the sake of their study, the team relied on data gathered by the VLT’s extremely sensitive and high-precision instruments. These included the GRAVITY astrometric and interferometry instrument, the Spectrograph for INtegral Field Observations in the Near Infrared (SINFONI) instrument, and the Nasmyth Adaptive Optics System (NAOS) – Near-Infrared Imager and Spectrograph (CONICA) instrument, which are together known as NACO. The new infrared observations collected by these instruments allowed the team to monitor one of the stars (S2) that orbits Sagittarius A* as it passed in front of the black hole – which took place in May of 2018. At the closest point in its orbit, the star was at a distance of less than 20 billion km (12.4 billion mi) from the black hole and was moving at a speed in excess of 25 million km/h (15 million mph) – almost three percent of the speed of light. Whereas the SINFONI instrument was used to measure the velocity of S2 towards and away from Earth, the GRAVITY instrument in the VLT Interferometer (VLTI) made extraordinarily precise measurements of the changing position of S2 in order to define the shape of its orbit. The GRAVITY instrument then created the sharp images that revealed the motion of the star as it passed close to the black hole. The team then compared the position and velocity measurements to previous observations of S2 using other instruments. They then compared these results with predictions made by Newton’s Law of Universal Gravitation, General Relativity, and other theories of gravity. As expected, the new results were consistent with the predictions made by Einstein over a century ago. When observed with the VLT’s new instruments, the team noted an effect called gravitational redshift, where the light coming from S2 changed color as it drew closer to the black hole. This was caused by the very strong gravitational field of the black hole, which stretched the wavelength of the star’s light, causing it to shift towards the red end of the spectrum. Whereas other tests have been performed that have confirmed Einstein’s predictions, this is the first time that the effects of General Relativity have been observed in the motion of a star around a supermassive black hole. In this respect, Einstein has been proven right once again, using one the most extreme laboratory to date! What’s more, it confirmed that tests involving relativistic effects can provide consistent results over time and space. In the near future, another relativistic test will be possible as S2 moves away from the black hole. This is known as a Schwarzschild precession, where the star is expected to experience a small rotation in its orbit. The GRAVITY Collaboration will be monitoring S2 to observe this effect as well, once again relying on the VLT’s very precise and sensitive instruments. During the 1970s, astronomer became aware of a massive radio source at the center of our galaxy that they later realized was a Supermassive Black Hole (SMBH) – which has since been named Sagittarius A*. And in a recent survey conducted by NASA’s Chandra X-ray Observatory, astronomers discovered evidence for hundreds or even thousands of black holes located in the same vicinity of the Milky Way. But, as it turns out, the center of our galaxy has more mysteries that are just waiting to be discovered. For instance, a team of astronomers recently detected a number of “mystery objects” that appeared to be moving around the SMBH at Galactic Center. Using 12 years of data taken from the W.M. Keck Observatory in Hawaii, the astronomers found objects that looked like dust clouds but behaved like stars. The research was conducted through a collaboration between Randy Campbell at the W.M. Keck Observatory, members of the Galactic Center Group at UCLA (Anna Ciurlo, Mark Morris, and Andrea Ghez) and Rainer Schoedel of the Instituto de Astrofisica de Andalucia (CSIC) in Granada, Spain. The results of this study were presented at the 232nd American Astronomical Society Meeting during a press conference titled “The Milky Way & Active Galactic Nuclei”. The researchers made their discovery using 12 years of spectroscopic measurements obtained by the Keck Observatory’s OH-Suppressing Infrared Imaging Spectrograph (OSIRIS). These objects – which were designed as G3, G4, and G5 – were found while examining the gas dynamics of the center of our galaxy, and were distinguished from background emissions because of their movements. Astronomers first discovered G-objects in proximity to Sagittarius A* more than a decade ago – G1 was discovered in 2004 and G2 in 2012. Initially, both were thought to be gas clouds until they made their closest approach to the supermassive black hole and survived. Ordinarily, the SMBHs gravitational pull would shred gas clouds apart, but this did not happen with G1 and G2. Because these newly discovered infrared sources (G3, G4, and G5) shared the physical characteristics of G1 and G2, the team concluded that they could potentially be G-objects. What makes G-objects unusual is their “puffiness”, where they appear to be cloaked in a layer of dust and gas that makes them difficult to detect. Unlike other stars, astronomers only see a glowing envelope of dust when looking at G-objects. “If they were gas clouds, G1 and G2 would not have been able to stay intact. Our view of the G-objects is that they are bloated stars – stars that have become so large that the tidal forces exerted by the central black hole can pull matter off of their stellar atmospheres when the stars get close enough, but have a stellar core with enough mass to remain intact. The question is then, why are they so large? After examining the objects, the team noticed that there was a great deal of energy was emanating from them, more than what would be expected from typical stars. As a result, they theorized that these G-objects are the result of stellar mergers, which occur when two stars that orbit each other (aka. binaries) crash into each other. This would have been caused by the long-term gravitational influence of the SMBH. Looking ahead, the team plans to continue following the size and shape of the G-objects’ orbits in the hopes of determining how they formed. They will be paying especially close attention when these stellar objects make their closest approach to Sagittarius A*, since this will allow them to further observe their behavior and see if they remain intact (as G1 and G2 did). At the center of our galaxy resides a Supermassive Black Hole (SMBH) known as Sagittarius A. Based on ongoing observations, astronomers have determined that this SMBH measures 44 million km (27.34 million mi) in diameter and has an estimated mass of 4.31 million Solar Masses. On occasion, a star will wander too close to Sag A and be torn apart in a violent process known as a tidal disruption event (TDE). These events cause the release of bright flares of radiation, which let astronomers know that a star has been consumed. Unfortunately, for decades, astronomers have been unable to distinguish these events from other galactic phenomena. But thanks to a new study from by an international team of astrophysicists, astronomers now have a unified model that explains recent observations of these extreme events. The study – which recently appeared in the Astrophysical Journal Letters under the title “A Unified Model for Tidal Disruption Events” – was led by Dr. Jane Lixin Dai, a physicist with the Niels Bohr Institute’s Dark Cosmology Center. She was joined by members from University of Maryland’s Joint Space-Science Institute and the University of California Santa Cruz (UCSC). In the past few years, a few dozen candidates for tidal disruption events (TDEs) have been detected using wide-field optical and UV transient surveys as well as X-ray telescopes. While the physics are expected to be the same for all TDEs, astronomers have noted that a few distinct classes of TDEs appear to exist. While some emit mostly x-rays, others emit mostly visible and ultraviolet light. As a result, theorists have struggled to understand the diverse properties observed and create a coherent model that can explain them all. For the sake of their model, Dr. Dai and her colleagues combined elements from general relativity, magnetic fields, radiation, and gas hydrodynamics. The team also relied on state-of-the-art computational tools and some recently-acquired large computer clusters funded by the Villum Foundation for Jens Hjorth (head of DARK Cosmology Center), the U.S. National Science Foundation and NASA. In the coming years, a number of planned survey projects are expected to provide much more data on TDEs, which will help expand the field of research into this phenomena. These include the Young Supernova Experiment (YSE) transient survey, which will be led by the DARK Cosmology Center at the Niels Bohr Institute and UC Santa Cruz, and the Large Synoptic Survey Telescopes (LSST) being built in Chile. This improved understanding of how black holes occasionally consume stars will also provide additional tests for general relativity, gravitational wave research, and help astronomers to learn more about the evolution of galaxies. Since the 1970s, astronomers have understood that a Supermassive Black Hole (SMBH) resides at the center of the Milky Way Galaxy. Located about 26,000 light-years from Earth between the Sagittarius and Scorpius constellations, this black hole has come to be known as Sagittarius A* (Sgr A*). Measuring 44 million km across, this object is roughly 4 million times as massive as our Sun and exerts a tremendous gravitational pull. Since that time, astronomers have discovered that most massive galaxies have SMBHs at their core, which is what separates those that have an Active Galactic Nuclei (AGN) from those that don’t. But thanks to a recent survey conducted using NASA’s Chandra X-ray Observatory, astronomers have discovered evidence for hundreds or even thousands of black holes located near the center of the Milky Way Galaxy. The study which described their findings was recently published in the journal Nature under the title “A density cusp of quiescent X-ray binaries in the central parsec of the Galaxy“. The study was led by Chuck Hailey, the Pupin Professor of Physics and the Co-Director of the Columbia Astrophysics Laboratory (CAL) at Columbia University, and including members from the Instituto de Astrofísica at the Pontificia Universidad Católica de Chile and the Harvard-Smithsonian Center for Astrophysics. The center of the Milky Way Galaxy, with X-ray binaries circled in red, other X-ray sources circled in yellow, and Sagittarius A* circled in blue at the center. Credit: NASA/CXC/Columbia University/C. Hailey et al. Using Chandra data, the team searched for X-ray binaries containing black holes that were in the vicinity of Sgr A*. To recap, black holes are not detectable in visible light. However, black holes (or neutron stars) that are locked in close orbits with a star will pull material from their companions, which will then be accreted onto the black holes’ disks and heated up to millions of degrees. This will result in the release of X-rays which can then be detected, hence why these systems are called “X-ray binaries”. Using Chandra data, the team sought out X-ray of sources that were located within roughly 12 light years of Sgr A*. They then selected sources with X-ray spectra similar to those of known X-ray binaries, which emit relatively large amounts of low-energy X-rays. Using this method, they detected fourteen X-ray binaries within about three light years of Sgr A*, all of which contained stellar-mass black holes (between 5 and 30 times the mass of our Sun). Two of these sources had been identified by previous studies and were eliminated from the analysis, while the remaining twelve (circled in red in the image above) were newly-discovered. Other sources which relatively large amounts of high energy X-rays (labeled in yellow) were believed to be binaries containing white dwarfs. Hailey and his colleagues concluded that the majority of the dozen X-ray binaries were likely to contain black holes, based on their variability and the fact that their X-ray emissions over the course of several years was different from what is expected from binaries containing neutron stars. Given that only the brightest X-ray binaries containing black holes are likely to be detectable around Sgr A* (given its distance from Earth), Hailey and his colleagues concluded that this detection implies the existence of a much larger population. By their estimates, there could be at least 300 and as many as one thousand stellar-mass black holes present around Sgr A*. These findings confirmed what theoretical studies on the dynamics of stars in galaxies have indicated in the past. According to these studies, a large population of stellar mass black holes (as many as 20,000) could drift inward over the course of millions of years and collect around an SMBH. However, the recent analysis conducted by Hailey and his colleagues was the first observational evidence of black holes congregating near Sgr A*. Naturally, the authors acknowledge that there are other explanations for the X-ray emissions they detected. This includes the possibility that half of the dozen sources they observed are millisecond pulsars – very rapidly rotating neutron stars with strong magnetic fields. However, based on their observations, Hailey and his team strongly favor the black hole explanation. In addition, a follow-up study conducted by Aleksey Generozov (et al.) of Columbia University – titled “An Overabundance of Black Hole X-Ray Binaries in the Galactic Center from Tidal Captures” – indicated that there could be as many as 10,000 to 40,000 black holes binaries at the center of our galaxy. According to this study, these binaries would be the result of companions being captured by black holes. Artist’s impression of merging binary black holes. Credit: LIGO/A. Simonnet. In addition to revealing much about the dynamics of stars in our galaxy, this study has implications for the emerging field of gravitational wave (GW) research. Essentially, by knowing how many black holes reside at the center of galaxies (which will periodically merge with one another), astronomers will be able to better predict how many gravitational wave events are associated with them. From this, astronomers could create predictive models about when and how GW events are likely to happen, and well as discerning what role they may play in galactic evolution. And with next-generation instruments – like the James Webb Space Telescope (JWST) and the ESA’s Advanced Telescope for High Energy Astrophysics (ATHENA) – astronomers will be able to determine exactly how many black holes reside near the center of our galaxy. Compared to some other galaxies in our Universe, the Milky Way is a rather subtle character. In fact, there are galaxies that are a thousands times as luminous as the Milky Way, owing to the presence of warm gas in the galaxy’s Central Molecular Zone (CMZ). This gas is heated by massive bursts of star formation that surround the Supermassive Black Hole (SMBH) at the nucleus of the galaxy. The core of the Milky Way also has a SMBH (Sagittarius A*) and all the gas it needs to form new stars. But for some reason, star formation in our galaxy’s CMZ is less than the average. To address this ongoing mystery, an international team of astronomers conducted a large and comprehensive study of the CMZ to search for answers as to why this might be. 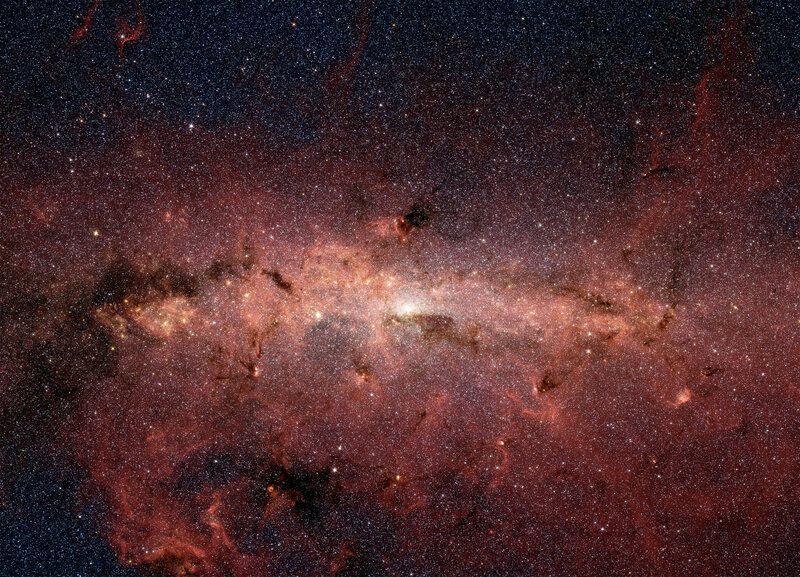 The study, titled “Star formation in a high-pressure environment: an SMA view of the Galactic Centre dust ridge” recently appeared in the Monthly Notices of the Royal Astronomical Society. The study was led by Daniel Walker of the Joint ALMA Observatory and the National Astronomical Observatory of Japan, and included members from multiple observatories, universities and research institutes. For the sake of their study, the team relied on the Submillimeter Array (SMA) radio interferometer, which is located atop Maunakea in Hawaii. What they found was a sample of thirteen high-mass cores in the CMZ’s “dust ridge” that could be young stars in the initial phase of development. These cores ranged in mass from 50 to 2150 Solar Masses and have radii of 0.1 – 0.25 parsecs (0.326 – 0.815 light-years). To determine that the external pressure in the CMZ was greater, the team observed spectral lines of the molecules formaldehyde and methyl cyanide to measure the temperature of the gas and its kinetics. These indicated that the gas environment was highly turbulent, which led them to the conclusion that the turbulent environment of the CMZ is responsible for inhibiting star formation there. A radio image from the NSF’s Karl G. Jansky Very Large Array showing the center of our galaxy. Credit: NSF/VLA/UCLA/M. Morris et al. So in the end, the rate of star formation in a CMZ is not only dependent on their being a lot of gas and dust, but on the nature of the gas environment itself. These results could inform future studies of not only the Milky Way, but of other galaxies as well – particularly when it comes to the relationship that exists between Supermassive Black Holes (SMBHs), star formation, and the evolution of galaxies. For decades, astronomers have studied the central regions of galaxies in the hopes of determining how this relationship works. And in recent years, astronomers have come up with conflicting results, some of which indicate that star formation is arrested by the presence of SMBHs while others show no correlation. In addition, further examinations of SMBHs and Active Galactic Nuclei (AGNs) have shown that there may be no correlation between the mass of a galaxy and the mass of its central black hole – another theory that astronomers previously subscribed to. As such, understanding how and why star formation appears to be different in galaxies like the Milky Way could help us to unravel these other mysteries. From that, a better understanding of how stars and galaxies evolved over the course of cosmic history is sure to emerge. During the 1970s, scientists confirmed that radio emissions coming from the center of our galaxy were due to the presence of a Supermassive Black Hole (SMBH). Located about 26,000 light-years from Earth between the Sagittarius and Scorpius constellation, this feature came to be known as Sagittarius A*. Since that time, astronomers have come to understand that most massive galaxies have an SMBH at their center. What’s more, astronomers have come to learn that black holes in these galaxies are surrounded by massive rotating toruses of dust and gas, which is what accounts for the energy they put out. However, it was only recently that a team of astronomers, using the the Atacama Large Millimeter/submillimeter Array (ALMA), were able to capture an image of the rotating dusty gas torus around the supermassive black hole of M77. The study which details their findings recently appeared in the Astronomical Journal Letters under the title “ALMA Reveals an Inhomogeneous Compact Rotating Dense Molecular Torus at the NGC 1068 Nucleus“. The study was conducted by a team of Japanese researchers from the National Astronomical Observatory of Japan – led by Masatoshi Imanishi – with assistance from Kagoshima University. Like most massive galaxies, M77 has an Active Galactic Nucleus (AGN), where dust and gas are being accreted onto its SMBH, leading to higher than normal luminosity. For some time, astronomers have puzzled over the curious relationship that exists between SMBHs and galaxies. Whereas more massive galaxies have larger SMBHs, host galaxies are still 10 billion times larger than their central black hole. This naturally raises questions about how two objects of vastly different scales could directly affect each other. As a result, astronomers have sought to study AGN is order to determine how galaxies and black holes co-evolve. For the sake of their study, the team conducted high-resolution observations of the central region of M77, a barred spiral galaxy located about 47 million light years from Earth. Motion of gas around the supermassive black hole in the center of M77. The gas moving toward us is shown in blue and that moving away from us is in red. Credit: ALMA (ESO/NAOJ/NRAO), Imanishi et al. In the past, astronomers have observed the center of M77, but no one has been able to resolve the rotating torus at its center until now. This was made possible thanks to the superior resolution of ALMA, as well as the selection of molecular emissions lines. These emissions lines include hydrogen cyanide (HCN) and formyl ions (HCO+), which emit microwaves only in dense gas, and carbon monoxide – which emits microwaves under a variety of conditions. However, their observations also indicated that the distribution of gas around an SMBH is more complicated that what a simple unified model suggests. According to this model, the rotation of the torus would follow the gravity of the black hole; but what Imanishi and his team found indicated that gas and dust in the torus also exhibit signs of highly random motion. These could be an indication that the AGN at the center of M77 had a violent history, which could include merging with a small galaxy in the past. In short, the team’s observations indicate that galactic mergers may have a significant impact on how AGNs form and behave. In this respect, their observations of M77s torus are already providing clues as to the galaxy’s history and evolution. The study of SMBHs, while intensive, is also very challenging. On the one hand, the closest SMBH (Sagitarrius A*) is relatively quiet, with only a small amount of gas accreting onto it. At the same time, it is located at the center of our galaxy, where it is obscured by intervening dust, gas and stars. As such, astronomers are forced to look to other galaxies to study how SMBHs and their galaxies co-exist. And thanks to decades of study and improvements in instrumentation, scientists are beginning to get a clear glimpse of these mysterious regions for the first time. By being able to study them in detail, astronomers are also gaining valuable insight into how such massive black holes and their ringed structures could coexist with their galaxies over time.